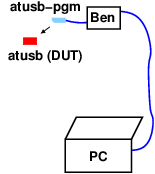 Note that atben has no microcontroller and therefore does not need any flashing. The flashing takes about 20-30 seconds. If it should fail, make sure you properly placed atusb-pgm and try again. If it keeps on failing, remove atusb-pgm from the Ben and insert it again. If flashing fails despite numerous attempts, proceed to the fault analysis. The flashing script will wait up to 30 seconds for enumeration. Once the atusb board has been detected, the script transfers the application with DFU. After this, you can proceed with the functional test. If the board fails to enumerate, proceed with the fault analysis.